Starbucks as well as many art galleries and original artists. styles in their artworks. >> Certificates. Toperfect Group, the Terminal to your hard journey of searching for art suppliers! Hand Painted Art! Factory Price! Toperfect Group has 100 odd talented painters to serve you reproductions to buy art online of over 50000 masterpieces by 350 famous artists in the world, in various styles of Neoclassical paintings, Tonalism art, Baroque oil painting, Rococo fine art, Romantic movement, Victorian art, European paintings, modern painting, contemporary artworks, POP art, Surrealism works, Realism oil painting, Asian paintings, Kinkade idyllic pictures, and more. Toperfect's Oil Paintings are painted with certified paints on linen canvas, in 150 popular subjects for sale such as portrait painting, Mediterranean art, landscape paintings, boat oil painting, wall art, Venice art, urban cityscapes, mountain artworks, warship oil painting, group panels, ballerina art, still life oil painting, under water art, palette knife paintings, seascape artworks, religious painting, African art, Indian works of Raja Ravi Varma, etc..
* Thank you! The painting looks beautiful! * I reviewed the first painting that you attached and am very pleased. It looks beautiful! Thank you for sending to me and I will look forward to the second painting. Reproductions by Professors at Art Colleges are famous artists paintings produced by professors and teachers at the National Fine Art Universities, they're almost 100% copies of the originals and suitable for collectors. Are you looking for a unique gift for your loved ones? 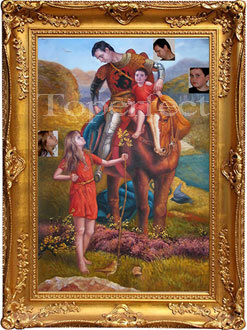 Why not ask Toperfect.com to turn your photo to beautiful portrait paintings? Since 1990s, as supplier of many famous art galleries in Europe and America, Toperfect served customers including Holland Royal, singers, movie stars, and more well-known persons. Custom Art brings the work of your dreams to reality, and is a lot easier than most people think. Using a combination of a deep description and possible pictures, an artist creates an artwork that meets the client’s standards. This could be anything from a themed oil painting, a fantasy artwork, or even a business painting. As long as the client can think of it, then it can be created and put on a canvas. This category allows the most freedom since absolutely anything can be done as long as the description is well thought out. Any paintings for sale by Toperfect Art can be hand painted in following techniques, but the final art reproductions will be a little different with the originals because of different materials and skills. Toperfect's painters design originals, these works show distinctive personality and painting style, they're new in market and affordable for art lovers. Toperfect.com will offer resellers formal Copyrights Authorization so that you can promote our designs in your local market. Ship to your door by express worldwide, don't need customs procedures! Toperfect Art handpicks 850 relaxing music for you to have a wonderful time in a cheerful frame of mind when shop paintings. These music cover classic, Folk, Jazz, violin, opera, popular songs, etc.. Come on! Toperfect evaluate and select good-quality original art to show online; the worldwide collectors purchase through our platform. Sell Now! The copyright of scripts in this website is owned by Toperfect. Toperfect.com reserves the manual scripts of original version. Toperfect Art will take appropriate legal action in the piracy and infringements of copyright. When an artist puts their creation on the canvas, it is a trust exercise. So when trying to purchase art and paintings, who do you trust? Toperfect art gallery should be at the top of your list, with some of the best customer service you can get worldwide. Services are also presented in an easy to understand system, with helpful live and email support for new users. Besides having multiple categories to choose fine art from, the site also incorporates a lot of history and biographical information about famous paintings that is useful to beginners and advanced users alike. It is a complete source of information for users that want to buy, or create artwork. The bread and butter of Toperfect gallery, and what separates it from competitors are the original paintings that are for sale. They can’t be bought from anywhere else and they’re created 100% in-house by a team of talented painters. These fully copyrighted works are beautiful one of a kind items that you’ll want to show friends and family. Buyers that want to put the oil paintings on a website, in a brochure or in any other media can obtain a copyright authorization from Toperfect. It’s an easy process that won’t take long at all, and give you full authority to show off the artwork that you’re so proud of. The art paintings for sale are so nice that Toperfect reviews are positive, no Toperfect complaints especially when you may ask for refund by PayPal. Originals blend a mixture of old and new arts, but do it in a way without losing the Eastern roots. It’s a nice compromise that gives users the best quality and creativity without it looking like everything else on the copy market of famous paintings. A single original oil on canvas from Toperfect has more soul in it than many of the original works being created by mass producing warehouses. The lighter touch shown in each art painting will differ from anything you’ve ever seen. Some notable originals are list below. Mermaid in silver moon, back of cowboy western, dancing girl, Chinese girl with sword, girl behind mask and band in purple wall. There are 147 original paintings to buy from, and the collection grows larger each and every day. Sometimes catching that perfect memory can be more detailed than clicking the capture button. If you have a picture that you want brought to life in a different way, then portrait painting may be for you. It doesn’t end with just pictures of people, but can include dogs, cats and just about anything you can fit. This style of oil painting not only works great as a gift but is the perfect way to capture a moment that meant something special to a significant other. Having this done for a wedding would surely take your lovers breath away, and many of the picture to portraits done of infants have brought tears to the eyes of parents. There really is no limit to the amount of creativity that goes into this form, and the turnaround time is faster with Toperfect’s artists than with any other company. With easy to follow instructions that start with emailing the photo you want, customers are sure to get exactly what they expected with no surprises but the good ones. Satisfaction with portrait to painting for sale is 100% guaranteed. In this more detailed creation process users can combined two pictures and merge them into one final art piece. This isn’t restricted to real life photos, and grants a lot more creativity than portraits since you can create your own masterpiece. A nice touch to these creations is that you can sign the oil painting when it’s finished. Beyond the wonderful gifting ideas, imagine merging a photo of your family in some of the most famous landmarks in the world. It’s a fun way to create some smiles in a room, and those same smiles can be new creations if you choose to send them in. Since this is a more detailed process compared to the last one, then users should pay careful attention to the two oil paintings for sale they are merging. The background of canvas painting becomes extra important since it will take up most of the picture, and the more colors there are then the more it will pop. Users can follow the same instructions by submitting through email, or they can even upload online through the website. Doing this lets you play around with some of the effects. The only thing to mention is that if sending by email, make sure to be as descriptive as possible to get the best result of picture to art. With paintings for sale in 150 subjects from artworks by 350 famous painters, there are enough hand painted masterpieces for everyone. The large painting staff at Toperfect gallery is 100 strong and at the top of their class when it comes to oil painting reproductions. Subjects available that you can choose range from the landscape, kids art, wall decor, nature, still life, abstract painting, African, antique, Tibet, black and white, beach art, Buddha, cheap paintings, watercolor, western, Chinese painting, Christian art, classic, contemporary works, dog, flower oil painting, framed art, horse paintings, Italian, Jesus art, modern, and women. A good break down of the paintings for sale in some of the categories is listed below. 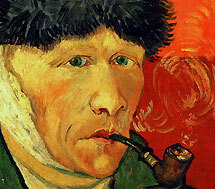 Dutch painter Vincent van Gogh and over 529 of his best post-Impressionist works. This includes Sunflowers and Night Cafe. Italian Renaissance painter Leonardo da Vinci, with 53 handpicked famous oil paintings like Baptism of Christ and the Mona Lisa. Gustave Klimt is a late 1800’s early 1900’s Austrian symbolist painter with about 162 art for sale on Toperfect. Part of his masterpieces is the incredible Symbolism series and the Kiss. His original paintings have sold for over $100 million dollars. American oil painter Thomas Kinkade was one of the notable painter of light. With 324 oil paintings available for reproduction, he is one of the most overlooked artists available. Toperfect.com is a great gallery online for original paintings, reproductions, pictures to paintings and other art for sale. As a complete solution buyers can expect to spend hours a day on the website and still not even scratch the surface of the websites great content. With all of the awesome additions in the marketplace, some of the most memorable ones still comes from Toperfect oil painting gallery. Toperfect doesn't just produce work to display in your home, but also sell paintings to art galleries all over the world and supply art to top companies including Walmart and Starbucks. Toperfect continues the tradition of great artists using the reproduction of pre-existing works for an income while they evolve their own styles outside of the workshop. This means the painting you buy from Toperfect could have been produced by a future star of the art world. Please check here to read our customers' Toperfect Reviews, Comments, and Ratings about Toperfect company reputation. Take pictures of oil painting for sale to send you by email, keep working till satisfy you! van Gogh: Sunflowers, bandaged ear. 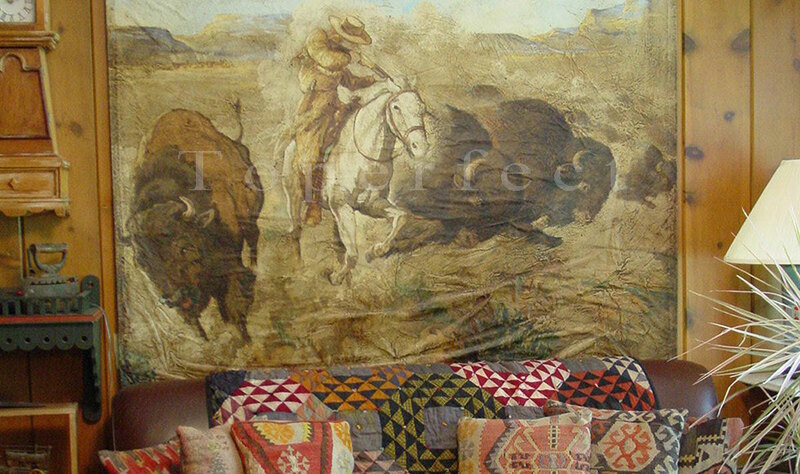 Printing products are in want of the artistic value of hand painted art. In addition, they are flat and lack the stereoscopic and touch of the original works. Toperfect provide a platform to connect collectors with original artists. 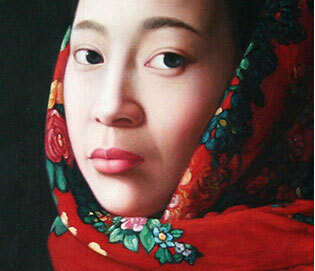 We evaluate and select good-quality paintings for sale; the worldwide collectors purchase through our platform. Copyright © 1995 - . Toperfect is trademark of Toperfect Group, see certificates.